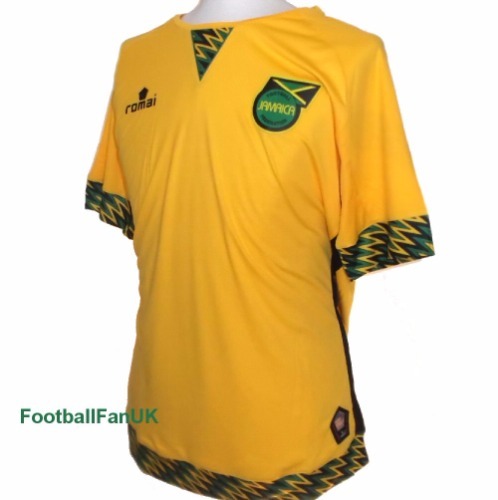 This is the official short sleeve home shirt, of the Jamaican national team, the 'Reggae Boyz', for the 2015/16 season and used by the team at the 2015 Copa America. Made by Romai, these shirts are brand new with tags in the original manufacturers packaging. - Lightweight plastic Jamaican Federation badge. - Yellow with green and black trim. - New with tags in Romai packaging with authenticity hologram. - Adult Size Small. Chest 41" Length 27". [Loose fit]. - Adult Size Medium. Chest 43" Length 28". [Loose fit]. - Adult Size Large. Chest 45" Length 29". - Adult Size XL. Chest 47" Length 30". - Adult Size XXL. Chest 49" Length 31".